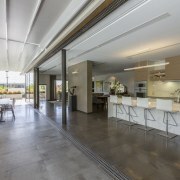 This kitchen is part of a whole house renovation and modernisation by Rodrigues Bodycoat, with architect Simon Rodrigues leading the design team. With much of the day-to-day workings relegated to the scullery behind, and with two large refrigerators fully integrated into the grey lacquered side cabinets, the front-of-house kitchen stays neat and uncluttered. 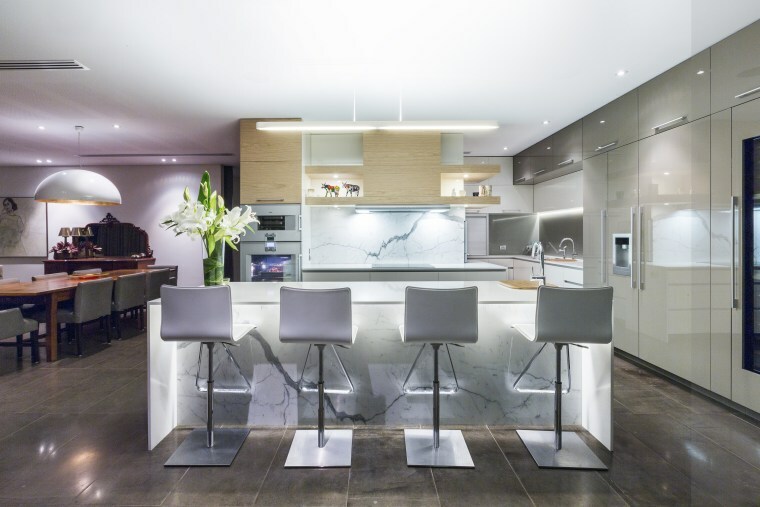 Open-plan kitchens on show to adjacent living spaces often have two personalities one front of house, the other behind the scenes. 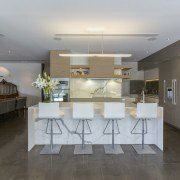 This white and wood kitchen by architect Simon Rodrigues divides in such a way and even fits a study into the mix. 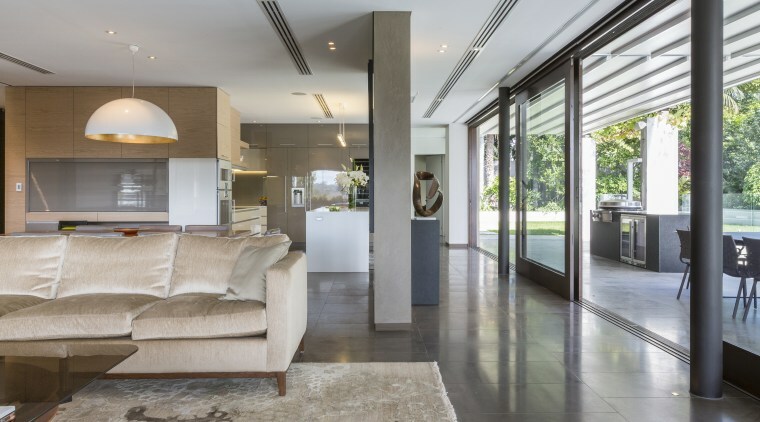 Replacing a smaller, enclosed kitchen with just a servery to the living areas, the new design connects easily with the adjacent living and dining areas, says Rodrigues. 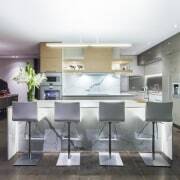 "To help integrate the new kitchen with the living space, we ran the timber veneer cabinetry around from the kitchen to the side that faces the living areas. This includes a study nook which can be concealed by drawing down a roller door." The front of the kitchen adds to this inter-connected feel, with furniture-like timber shelves running off a central upper wood cabinet that houses the rangehood. 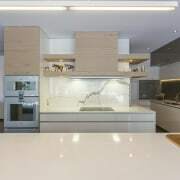 "The owners had requested somewhere to display prized design pieces and this custom rangehood cabinet fitted the bill." Together, the recessed cabinet handles and the slender, elegant waterfall edge on the island give the kitchen a minimalist feel. 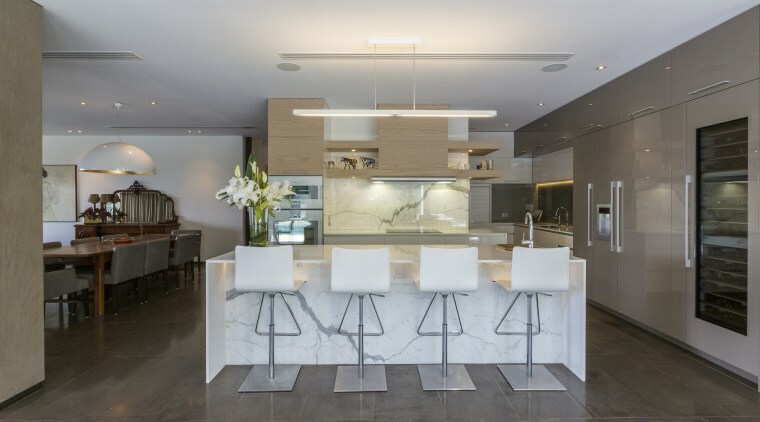 The dark veined marble surfaces on the front of the island and the splashback also introduce an upmarket ambience. 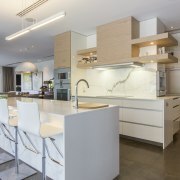 A long suspended light provides bright task lighting for this kitchen island. There is a prep sink on the island, and two wall ovens are on display, but the rest of the business end of the large kitchen is relegated to the scullery around the corner. A sink, dishwasher and coffee maker are set between the scullery and kitchen so they can be accessed from either space. 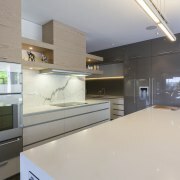 Both the Venato marble and lacquered cabinet surfaces were chosen by the owner, while the benchtops are engineered stone.